NOOTKA ISLAND, B.C. — The afternoon sun glints sharply off the rolling blue swell south of Rosa Island and it’s difficult to follow Brad’s finger to where the glistening bulbs of ocean kelp end and the glossy heads of sea otters begin. We squint from our kayaks’ cautious distance to take in the fragile “raft” that the otters have created on a bed of seaweed. Brad Comeau — one of two Gabriola Cycle and Kayak guides who’ve accompanied this group of six paddlers to the edges of Nuchatlitz provincial park — describes how twenty or so otters will float together on their backs to groom their thick, insulating fur and feed on sea urchins they have gathered on their belly. Paddling a wide swath past other relaxed-looking rafts, it’s hard to believe that it was the sea otter’s famously luxuriant coat that led to this creature’s near extinction. A couple of century’s worth of fur industry and oil spills diminished their numbers so thoroughly that conservationalists had to bring 89 down from Alaska thirty years ago. Only 3,200 of the threatened species now exist along the Pacific Coast and a few hundred find protection in this 2,135-hectare foreshore park. 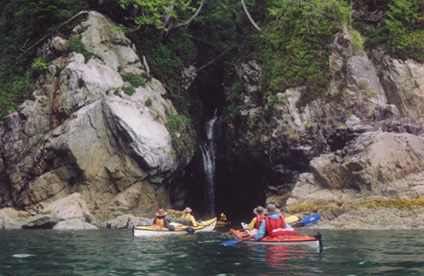 Encompassing the northwestern tip of Nootka Island and a number of small island groups, Nuchatlitz provincial park was established in 1996 to do just that: protect significant natural and cultural features that — like the sea otter rafts — find refuge in its islets, reefs and coves. The mostly coastal preserve hosts other threatened species such as the migrating grey whale and the marbled murrelet — a shy sea bird that lays just one egg a year in high, old-growth trees. Moist pairs of seal eyes follow us along Nootka Island’s irregular shore as we, in turn, watch a black bear beachcomb at low tide. Bald eagles and oyster-catchers dot the sky overhead and they occasionally drop to investigate morsels in the basalt tidal pools. With its sandal-shredding reefs and sky-high trees, Nuchatlitz initially seems a typical burly West Coast park. But after a few days, its delicate elements emerge: the percolating burble of a retreating tide, the shell-like sheen of a polished bone, the wet echo of a grotto waterfall and the silence of an abandoned homestead. The Nuu-chah-nulth people have inhabited this part of the coast for thousands of years. In fact, it was Chief Maquinna of the neighbouring Mowachaht band who paddled up to Captain Cook when he rounded Nootka Island’s southernmost point in 1778 and “discovered” B.C. Today, Nuchatlitz provincial park quietly guards a number of archaeological sites that mark the First Nations’ earlier presence. Pockets of communities adjoining the park remain their homes today. It’s at Nuchatl — an abandoned settlement that now acts as a water taxi liaison point — where our group of resting paddlers catches sight of what will become a theme for our six-day trip. The air is quiet except for the slap of dry bags over beach pebbles and suntan lotion over skin. At the end of the point about 500 metres away, a black bear picks an unhurried path across the wet sand and slippery kelp. It reaches the channel, sniffs it, then leisurely descends into the clear water like a matron into a tub. “That is one relaxed-looking bear,” someone comments as it swims to a nearby island. We pack the kayaks — and when it comes time to set out for Belmont Point — we take a hint from the seals, sea otters and bears that surround us. We dip our paddles into the sparkling ocean and keep our strokes slow and serene. Nuchatlitz provincial park is on the west coast of Vancouver Island, approximately 110 km northwest of Tofino and 18 km southwest of Zeballos. Access is by water or air only. To learn more about the park, visit the BC Parks web site. Gabriola Cycle and Kayak is one of several tour companies that offers supported tours. Zeballos Expeditions provides rentals, water taxi and support for self-guided paddlers. Published in the August 29 2005 Adventure section of The Province, a CanWest Global publication.